One of my earliest creations for TS4 was something of an oddity I had never seen: v-neck baseball tee. Because of that i had to make them for my game. Now with the process of remaking my CAS items, I decided to revisit these favourites and give them an overhaul plus adding a new style. Now i will get even more use out of these. 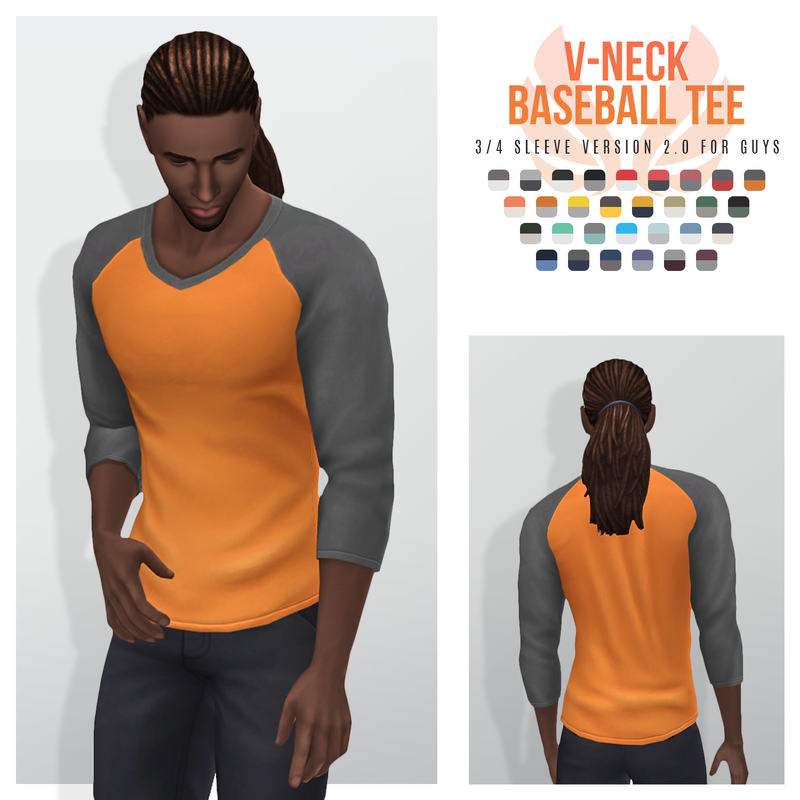 I have been updating for Seasons, but only the short sleeve one gets Hot weather use out of these, since the other two fell into a grey area not covered by either of the new categories, so i decided to not apply the filter for the 2/4 and long sleeve versions. Like usual, you can remove the filter to use them in either category like any other clothing category. 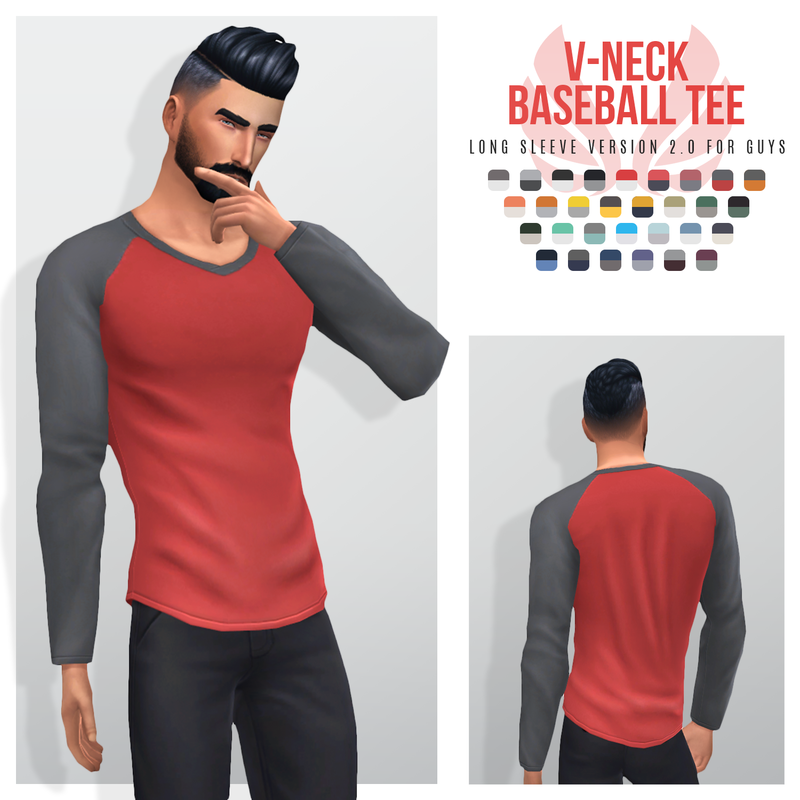 This can be used on bodies other then masculine frames, but just be aware that the mesh is not optimised for the other body frame type much like all other items converted from men to women with the unisex patch. I have not disabled them as someone might find a use but you will only find them under the masculine filter or if you remove the filter from the search bar in CAS. To install, download below from one of the sources then using WINZip/WinRAR/7Zip/Unarchiver extract the archive (if needed) and place the package file/s in your mods folder, then look for them in your game. If you are having issues check out my Installing Content help page. Hi! Thanks so much for sharing your CC with us. 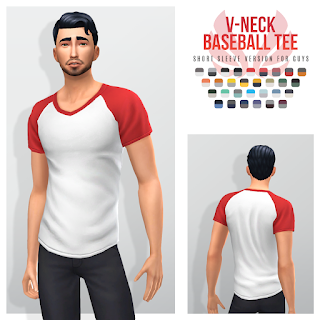 Would you be able to tell me what hair the sim in the red and gray shirt is wearing above? Thank you!